The Simatai section of the Great Wall is one of the few sections to retain the original appearance of the Great Wall. It’s very varied in makeup. Simatai has many characteristics of other Great Wall sections, and some unique features of its own. It&apos;s the only section opened for a night tour. Distance from Beijing: 120 kilometers (75 miles), 2 hours 15 minutes drive. Simatai’s Great Wall is north of Miyun Town, close to another Great Wall section at Gubeikou, about 120 kilometers (75 miles) from central Beijing. It enables access to Gubeikou, an important pass of great military significance on the route to the capital city of Beijing. Simatai Great Wall stretches 5.4 km from Wangjinglou (‘Viewing Capital Tower’) in the east to the Jinshanling Great Wall section in the west. The Simatai Section of the Great Wall was originally constructed in the Northern Qi Dynasty (550–577) . It was rebuilt and extended in the early Hongwu years (1368–1398) of the Ming Dynasty. Like most sections of the Ming Dynasty Great Wall often visited today, this section also underwent construction under the supervision of General Qi Jiguang (1528–1588). Simatai Great Wall is 5.4 km (3.4 miles) long, with altogether 39 watchtowers. At the east of Simatai, the elevation goes abruptly up from 295 meters (968 ft) to 986 meters (3,235 ft), making a breathtaking scene. The wall is very steep and perilous, with the narrowest part only 40 cm wide. It’s "perilous, dense, diverse, artful, and peculiar". A Chinese expert on the Great Wall of China once said: "The Great Wall is the best architecture in China, while the Simatai Great Wall section is the best among the Great Wall sections". The wall is divided east-west by Simatai Reservoir, with 16 towers east and 23 towers west. The two parts are linked by a chain bridge. Today there’s a zip line ("Flying Fox") over the lake for travelers to cross quickly. The mountains in western Simatai are gently sloping, but eastern Simatai is high with steep ridges. 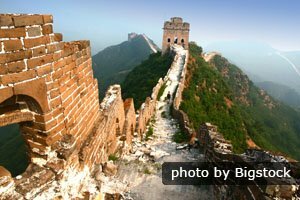 The eastern Simatai wall is very peculiar, where ‘Heavenly Ladder’ and ‘Sky Bridge’, the two steepest parts at the top, are very striking. Heavenly Ladder is a steep and narrow section of wall (about 50cm/20" at its narrowest), which go up at about 45 degrees to the mountain peak, with cliffs on both sides. At its end is the Sky Bridge, which is not more than 100 meters (300 ft) long, but only 40 cm (16") wide. When this part was being constructed, bricks were bundled on goats&apos; back to the mountain top. This section of wall was built on high mountain ridges. Perilousness: The eastern part of Simatai’s Great Wall was built along steep mountain ridges. 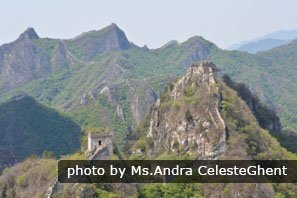 Diverse: There’s a huge range of towers, Great Wall shapes, and steepnesse s at Simatai.Visitors can traverse Simatai’s Great Wall by chain bridge, zip-line, or boat at the reservoir. Dense Watchtowers: The distance between watchtowers is about 100–200 meters (300–656 ft), with the nearest two only 44 meters (144 ft) apart. This is very dense, because the average watchtower separation is 500 meters (550 yards) for the Ming Dynasty Great Wall. Trivia: At Simatai visitors can find a section laid with bricks carrying inscriptions recording the date they were made, and the code number of the army who made them. 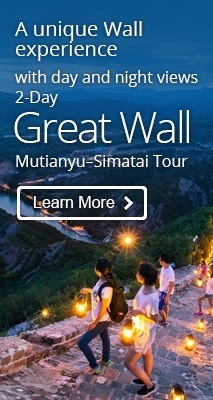 If you want to spend a night at the Great Wall, Simatai is a section that we recommend. There you can enjoy a well-lit night walk on the wall, and can stay at a range of 5-star hotels. 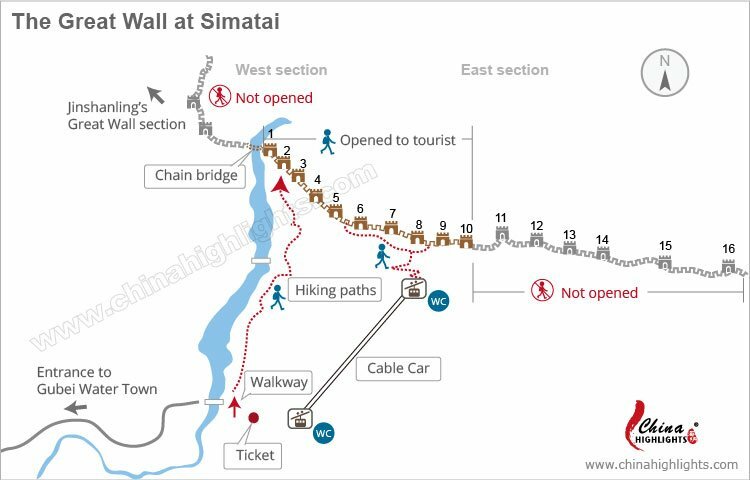 Simatai is not the only Great Wall section that is lit-up at night, but it is the best lit. 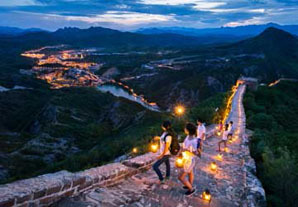 Its lighting is subtler and more sophisticated than at Badaling, and it is less crowded, making for a pleasant, atmospheric evening walk in a special setting. See the Great Wall in a new light — it’s definitely different from the day views. While the path up is safely lit and well-surfaced, the light pollution is tempered so that you can actually see the nighttime countryside from the wall without being dazzled. The whole night walking tour can be done comfortably in 1½ – 2hours. You only need 10 minutes’ walk or so to reach the cable car station from your hotel. Buy round-way cable car tickets for access. 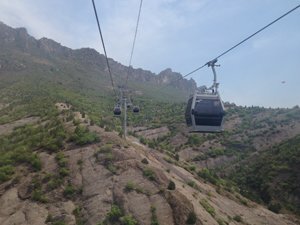 The cable car takes about 5 minutes, and the walk up to the Great Wall (the 5th watchtower) takes about a further 15 minutes. 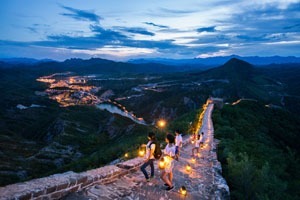 The end of the night walk between the 5th and 6th watchtowers is a flat section without steps, from which you can gaze out on Simatai village, other lighted lengths of Wall, and mountain silhouettes. The hotels at Simatai are the best among of the Great Wall’s sections. 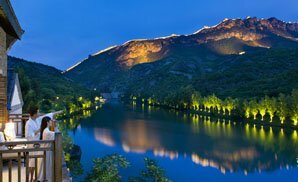 The Gubei Water Town resort at the foot of the Great Wall has several 5-star hotels, where you can enjoy a hot spring, massage, and a night swim after your evening stroll. The best times to visit are late spring, early and late summer, and fall (around May and September/October). (East) Simatai is wild, rugged, and very steep. It is very treacherous when it snows in winter. In early spring (March and early April) and early winter (November), it is still very cold on the wall when it is windy. It is very hot on the wall in mid-summer (July and August). There is no direct bus from downtown Beijing to Simatai. It takes about 2 hours to get to Simatai from central Beijing by public transportation and taxis. First go to Dongzhimen (东直门) by bus 24, 106, 107, 123, 132, 206, etc. ; or subway line 2, 13, or the Airport Express Line. Take Bus 980 from Dongzhimen Long Distance Bus Station to Miyun Town. Then take a taxi to the Simatai Great Wall (司马台长城). Negotiate with the driver the price (about 180 yuan for a round trip is reasonable [written 2015]). No English is spoken. If you want to travel free of hassles, contact us for a private tour with a private driver and guide. Bookings should be made one to ten days ahead, using real names (ID will be checked). After submitting your booking information, users receive a "booking message". Write down or print out the details, and make your visit to Simatai within the period of validity. Only visitors with valid "booking messages" and valid identity documents will be permitted to buy entry tickets in the visitor center square at Simatai Village. Visitors with reservations can take a shuttle bus to the Great Wall. 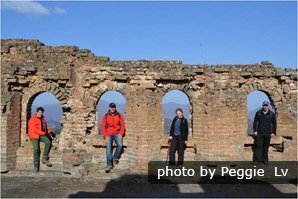 (Bus times: 10:20am, 11:00am, 2:00pm, 3:00pm) to the Great Wall at Simatai. Alternatively travel with us and we’ll make all the necessary arrangements for you. The East Simatai section of the Great Wall is rugged with high and steep steps. The wall is loose and dilapidated. Make sure you are physically strong enough if you plan to hike this part of wall. 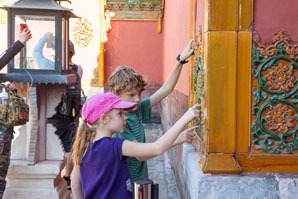 All travelers need to gather at the Simatai Village Entrance (a newly-built tourist village 1–2 km from the Great Wall). There are regular free shuttle buses serving the 1 km road to the Great Wall Entrance. The classic hike from the entrance, along the reservoir (1.5 km), via East Tower 1, up to East Tower 10 takes about 2 hours. You could take a boat on the reservoir to East Tower 1 from a pier about 100m from the Great Wall Entrance. You would need to change boats at the dam half way. The alternative is to take the cable car or rough steps towards East Tower 8. Climbing the steps from the entrance to the wall: the steps are steep and irregular (50 minutes or more). We don’t recommend our customers to take this option. Take the cable car most of the way up, from which you can walk to East Tower 5 or East Tower 8 (about 30 minutes). The cable car may stop operating when there are high winds. The strenuous hike from East Tower 8 to 16 takes an hour or more. If you complete the hike to Viewing Capital Tower, you might want to take a short cut back to the entrance, hiking down from East Tower 8 (about 45 minutes). Or from East Tower 8 you could even take the cable car down to the Great Wall Entrance. 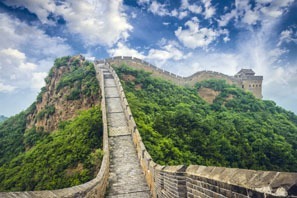 If you don’t want to do the dizzying ascent of Heavenly Ladder and Sky Bridge, you could descend on the Great Wall from East Tower 5 or 8 to East Tower 1 at the reservoir (about 30 minutes). You could take a boat on the reservoir from East Tower 1 to a pier about 100m from the Great Wall Entrance. You would need to change boats at the dam half way. The walk from East Tower 1 to the Great Wall Entrance, by the reservoir, takes 20 or 30 minutes. 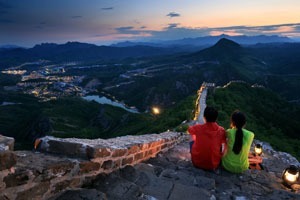 4-Day Secret of Beijing: Appreciate the stunning views of the Great Wall by night. 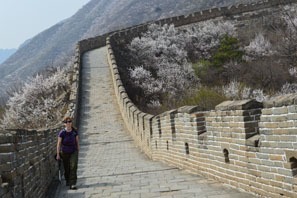 Or we can tailor-make a tour for you to explore the Great Wall according to your interests. Is China&apos;s Great Wall visible from space?